I seriously believed they all are dead, but to my great surprise and pleasure I´ve read in Hyder Jawad´s book "Four weeks in Montevideo" that Francisco Varallo (99), argentinian who played the 1930 final game between Urus and Argentina, is still alive and lives in Buenos Aires. Last edited by Kajoo; December 16th, 2009 at 22:13.
Who else is still alive ? From Czechoslovakia and Hungary, none. František Plánička (1904-1996) was the last living finalist of 1934 finals. Last Czechoslovak player from 1934 squad was Géza Kalocsay (1913-2008) who later represented Hungary on 1938 World Cup. He was the last living Czechoslovak and Hungarian player of pre-war era. No clue about players of other teams. Carvalho Leite (1912-2004) was a member of the Brazilian 1930 World Cup squad, as well as the 1934 squad. He was the last survivors of the Brazilian 1930 World Cup team. Fernand Jaccard (1907-2008) was the last men from Swiss 1934 squad. Lucien Laurent (1907-2005) was the last surviving member of the 1930 French team. Last edited by Kajoo; December 16th, 2009 at 23:10. As I have studied biography of many legends before the World War II, I never found that anyone was killed in that War. Especially, such as Willimowski from Poland, Ferenc Deak from Hungary or Fritz Walter from West Germany. I just wonder there is no great footballers was killed in the War even one ? I ask because I ever feel regrettable about losing some players in that War. f.e. Coventry City lost 5 players: Walter Kimberley (back), Steven Jackson, Tom Morris (centre-half), Jack Tosswill (inside-right) and Tubby Warren (inside-left). Arpad Weisz (1896-1944), hungarian-jewish player and coach, died in nazi camp Auschwitz. 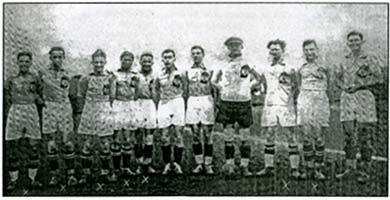 7 caps of hungarian NT (1922-23), played for Interazionale Milano, plus coached several italian temas (Inter, Bari, Bologna, Novara) and dutch Dordrecht. Last edited by Kajoo; January 10th, 2010 at 19:31. Acc.Hyder Jawad´y book "Four weeks in Montevideo" french player Alexandre Villaplane (1905-1944) who captained Franc on 1st World CUp 1930, died in WWII. "During the WWII he became a leader of North African Brigade, crominal organisation consisting of immigrants who collaborated with the Nazis through anti-Resistance activities. He went by the unflattering nickname of SS Mohammed. He was sentenced to Death on December 1st, 1944 for his involvement in at least ten murders and was executed by firing squad on December 26 at Fort de Montrogue"
Last edited by Kajoo; January 10th, 2010 at 20:25. Dr.Milutin Ivkovič (1906-1943) captained team Yugoslavia on the World Cup 1930. "A member of Communist Party (by choice rather than obligations ) he often found himslelf in trouble with the Authorities. His background proved to be his undoing when, after germans occupied Yugoslavia in 1941, Ivkovic was arrested. The Germans were aware of his political affiliations and his back-ground as an Olympic athlete. As a part of massacre that killed 80.000 people, he was murdered by Gestapo at Camp Banjica, jajinci, Yugoslavia, on May 23, 1943, aged 37"
Hirsch was the first Jew to ever play for the German National team, and was a member of Germany's 1912 Olympic squad. In 1943, he was deported to Auschwitz and was murdered in the concentration camp. He was killed in Pas de Calais on the Western front during World War I and buried in Hagnicourt. Hearts of Midlothian lost 7 players in WWI, Tottenham Hotspurs lost 11. There were over 5,000 men playing professional football in 1914. Of those, 2,000 joined the military services. Some of them joined up individually, but sometimes whole teams enlisted together. Clapton (now Leyton) Orient was the first. After Fred Parker, the team captain, went into the army, about 40 players and staff followed his example. They joined the 17th Battalion of the Middlesex Regiment, which became known as the "Footballers' Battalion" it had so many players in it! Second-in-command, Major Frank Buckley, was wounded in the shoulder and lung in 1917. He recovered to become manager of Wolves after the war. Last edited by Kajoo; January 10th, 2010 at 21:42.